All the news these days centers on the Republican Convention in Tampa and the storm battering the Gulf coast. In the midst of that, let’s not forget stories like this: Texas redistricting discriminates against minorities, federal court says. The unanimous decision — handed down by three judges appointed by George W. Bush and one appointed by President Obama — is clear and direct: the congressional redistricting plan developed by the GOP leaders of Texas is discriminatory and cannot stand. We all have good reasons (hopefully!) for making the choices we do at the ballot box. The President of the US has many powers and influences our country in countless ways. But long after any president forwards his mail from 1600 Pennsylvania Avenue, one of those presidential powers stands alone in significance: it’s his (her?) prerogative of nominating judges to the Federal Courts. 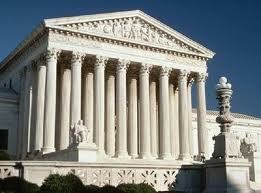 Certainly the bench of the US Supreme Court is paramount there. But, as the story above reminds us, federal judges at all levels play a critically important role in implementing the laws of our country and ensuring that America — as the inscription over the Supreme Court building says — is a place where there is Equal Justice Under Law. This fact alone — the president’s right of nominating justices to the US Supreme Court — is sufficient for for me to support President Obama in his bid for re-election. What’s your reason for your choice this election year? This entry was posted in Commentaries, Current Events and tagged DOMA, LGBT, President Obama, Supreme Court. Bookmark the permalink. For me, it is a simple decision, just three letters…JOBS ;o) Liberty for LGBT Americans can and will be improved; and we are already so much more blessed than LGBT folks in many parts of the world. But the potential for full liberty without a job is pretty meaningless; and President Obama after borrowing and spending all that money still has no clue how to fix the economy. Gerrymandering has been going on forever and is no reason to cast your vote for one party or the other. Both parties do it. Look at Maryland where the Democrats who control the process redistricted so that the Republicans would be dominant in 12.5% of the congressional seats whereas the Republicans get 40% of the vote. As you say about the Republican plan in Texas, the Democratic plan in Maryland is also discriminatory and should not stand.